Samovar is a great device for tea. It can be used not only at home but also outside the city. Design easy to move, as a rule, it does not take much space. The model is quite diverse, the choice in stores and purchase any of the samovar is not difficult. Decide about the model of samovar: there is coal that can be used outdoors, electric, applies to the housing conditions, and combined. Choose electric samovar, if you live in the apartment. Such a model can be not only a device for boiling water, but also elegant decoration. This samovar is very simple to use and safe. It provides fast boiling of water, it stays hot for a long time thanks to the brass, which retains heat well. 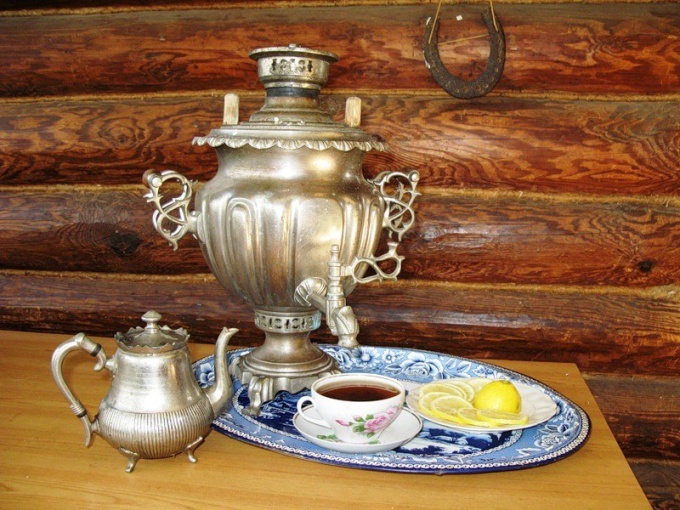 Buy the coal samovar, if you intend to use it in a country house, cottage or for a tea party in nature. Stock up on the necessary amount of fuel for a samovar coal, wood chips, pine cones, etc. To use this model you need a lot of space. Should learn to regulate the rod to the water in it was boiling. To any samovar must be accompanied by instructions for its use. Water from coal samovar with smoke and unique taste. Determined by the volume of the samovar. It must be selected on the basis of the number of people who will use them. A volume of 1.5 liters made electric samovar, they are compact and easy to carry. The most popular are designs from 3 to 7 liters. The volume 5, 7 or 10 litres typical for coal options. It is good to use for cooking boiling water for 5-10 people, as well as tea in the kettle. Decide on the color of the samovar. In stores you can find yellow brass, silver Nickel plated, with decorative painting, with a copper coating. As a result of oxidation of copper, part of brass, samovar can be covered over time, brown-red spots. Touch the object, the housing wall can be smooth or corrugated surround. Please note on the form of a purchased product, most likely the water boils in the samovar in the form of a cone. Buy samovar Nickel-plated or samovar hand painted, if you need easy-to-clean product. Brass samovars produced special tools for washing. Ask the seller about the warranty period (usually two years). The price of the samovar depends on the type of material and volume. In addition, it has a value whether it is a new samovar, restored by the masters of old, antique or vintage thing. Buying Antiques, check the flow on it, and does the key water. This can be done by simply filling up the samovar with water. This procedure is desirable to make at the time of purchase, so you do not look for the master or not to take the purchase under warranty.